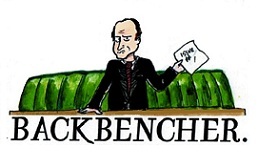 The Backbencher – What happened to universities being the places of ideas? When most people think about their experiences in university, they most likely think of the fun or mischief (or both) that they plan to engage in. Being chastised for telling a joke about oneself is not usually on the list. If Benjamin Sweetwood didn’t think this was the case then the experience he had was a rude awakening after he got in trouble for calling himself “handsome” in Chinese. One would hope that over the age of 18 (adult age in most countries although not in America) one’s maturity would have reached a level where jokes (even insensitive ones) can be ignored by peers and certainly the leaders of academia. It begs the question: how on earth did we enter a state where young adults are incredibly feeble and lack resilience? Even more sad is the fact that this lack of resilience is celebrated by so-called Social Justice Warriors. These soldiers will stop at nothing to convince the rest of the world to agree with them. They justify both their verbal and physical bullying by resigning themselves to perpetual victimhood. In this context (victimhood) their inappropriate actions are nothing but a defence. They are self-diagnosed victims who demand the sympathy of the world at a proverbial gunpoint. Now it is a crime to exalt oneself if one fits into the white-heterosexual category. It’s viewed as somewhat sinful to make direct comments about oneself. If you don’t have a right to make comments about yourself then who else does? The irony of chastising someone for a comment they made about themselves is that you’re infringing the rights of one’s freewill while accusing them of an identity crime. How ridiculous is it that one can’t even make a joke about oneself without offending a stranger? Why have we given so much sway to those who choose to be overly sensitive? We do them no favours by entertaining their childishness. They will face a massive shock post-graduation when the real world (the world outside safe spaces and gender-misconduct offices) inevitably introduces its harsh self. The selfish and attention-seeking will soon realise how much they’ve starved their emotional resilience. The reality that the world is not a safe space and that respect is earned and not seen as a human right by most might be too much to comprehend for most of these sensitive souls. A lot of workplaces don’t have HR departments or despise the concept altogether. To quote a staff member from a company that will remain a secret: “I’m not HR, I don’t have time to manage idiots”. Horrid, yes, but such views exist in the real world. How will the overly-sensitive cope in such an environment? Will they demand that their ‘offender’ is rebuked? We are training a generation to be resistant to the reality of the world outside their university walls. This is not a good return on the investment that is high tuition fees. Now, we shouldn’t create a society in which we pretend all words have no power and that insults are to be praised. But we should insist that reason is exercised over the mere worship of human feelings. Why should holding the view that calling oneself handsome is an offence be paid any attention? The idea that it was heeded to so that Benjamin had to spend time at the Dean’s office is ludicrous. There is no logical reason why someone should have a right to be offended by another person calling themselves handsome. It is difficult to not laugh at the tone of the article but behind the obvious ludicrousness of this case lies a dark idea that our feelings are of the utmost importance. We are living in a modern hedonistic culture where one idolises ones feelings and expects (in some cases demands) that the rest of the world bows to the altar of their feelings. Essentially, it’s “forget how you feel to make me feel better, or you will condemned”. In Benjamin’s case, his university Dean tried to force him to agree with the ‘victim’. This invasion of one’s right to expression was somehow presented as law and order in the context of exercising a gender based issue, or in our wider society, engaging in social justice. This is essentially bullying wearing the cloak of victimhood. The ‘victim’ of Benjamin’s comment managed to achieve anonymity and freedom in that they were not required to be present during the meeting with the Dean. Thus, this so-called victim was not inconvenienced in any way. An illogical form of authority has been granted to people with minimal emotional resilience so that should they choose to be offended at one’s comments, the ‘offender’ has to have their time invaded. Benjamin wasn’t given a choice to attend the meeting, he was instructed to. I use the word “bulling” because even Benjamin’s case manager admitted to not wanting to say what he thought of the programme. This abnormal fear of diversity of opinion paralyzes emotional strength and will leave these sensitive creatures vulnerable to the harsh realities of the world post university. The new social media rule that promises to criminalise certain tweets (jokes, photoshopped images etc.) will no doubt be abused by safe space ‘professors’. Christina Hoff Summers recently stated on Twitter that the University of Florida ‘will have a 24/7 counselling hotline for students triggered by micro-invalidating Halloween costumes’. Beyond the surface level question of why lies another question: who is paying these, well, let’s call them Safe Space telephone advisors? It is a waste of money if they are being paid and a waste of time if their service is voluntary. This dumbing down of the university experience is a grave threat to intellectualism. It has started sowing its seeds in academic halls in the UK. Recently a journalist who was scheduled to deliver a speech at the University of Cambridge was asking on Twitter if the students were as touchy as those at Oxford University. To paraphrase Stephen Fry: “So, you’re offended. So effing what?” There was a time when I thought “that’s rather harsh, Stephen’ but based on current events of massive triggering, I must agree with Fry. If you’re offended at a non-offence, why should anyone be invested in your ‘hurt feelings’? It is not your human right to be mollycoddled every time you’re in disagreement with someone. This obsession with victimhood and turning everything into an offence is an unwelcome distraction of real issues. Algemeiner (a Jewish Newspaper in America) recently reported that the head of UC Berkeley Jewish Student Union advised that anti-Semitic attacks are not being upheld with the severity of other issues. Thus there are real offences being overshadowed by emotionally fragile students. If we passively allow overly sensitive souls to reign the narrative of what is right and wrong we will risk ignoring true crimes of injustice.